If your heating isn't working properly power flushing could be the answer. There are a number of warning signs that can show up that indicate a build up of sludge within your central heating. At plumbers in Dublin we produce a thorough power flushing service at two thirds of the price of some of our competitors. Does your central heating system take ages to heat up? Are you coming across cold spots in your radiators? Does your water pump keep failing and you're noticing continuous problems with it. Does your boiler make strange noises and clunking sounds? Are you often bleeding your radiators? Are there leaks coming from pinholes in your radiators. All these are signs that power flushing would definitely benefit your central heating. Cold spots and clunking noises are signals that the sludge and gunk over a period of time has built up in the heat exchanger for example. This over a period of time if not attended to can irreversibly damage the heat exchange itself causing further problems. There are 2 main reasons. Firstly you may have a new boiler but your old one may have carried on for many years pumping gunk and sludge around your system. This can cause damage to your new boiler especially the heat exchange whilst also not giving you the maximum heat. Secondly check your new boiler warranty. The standard is 5 year parts but with nearly all manufacturers these days the fine print states. "For your warranty to be valid you must have your system power flushed prior to installation." The manufacturers recognize that the boiler can become damaged by the build up. Beware, if you do have an issue within the warranty the engineer may come out and take a water sample before starting any repair work. Then if they see no power flushing was done they will declare the warranty null and void. The first step when contacting us and arranging for your system to be power flushed is for us to come out and evaluate all the requirements to power flush your system. On the second visit we complete the process by attaching a specialist machine to pump chemicals through your system to clean it. Once done we add a corrosion inhibitor to prevent further corrosion. Please note power flushing can take 4-5 hours on average. The benefits include optimized heating performance thus saving money on heating bills and extending the life of your boiler and it's working parts. 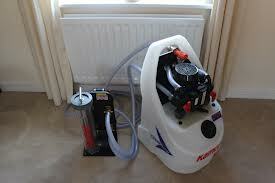 Our prices for power flushing range from €350-€450 excluding V.A.T. to arrange an appointment or get an exact price call 01-2603222.